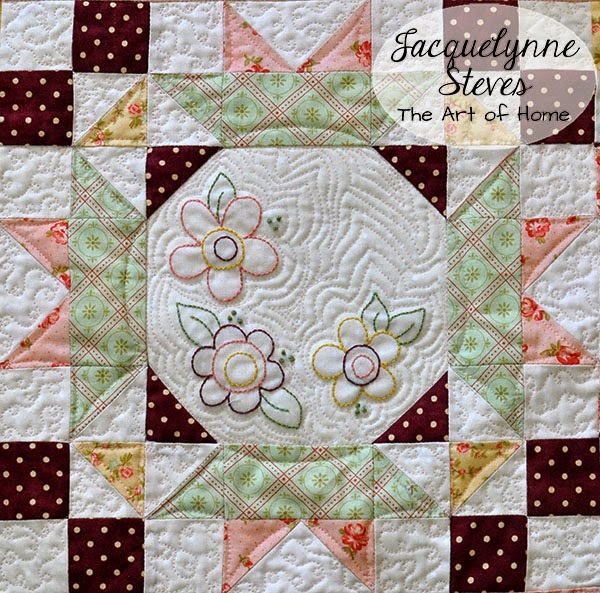 SEW SWEET SIMPLICITY - JACQUELYNE STEVES BLOG HOP - Mix up!! 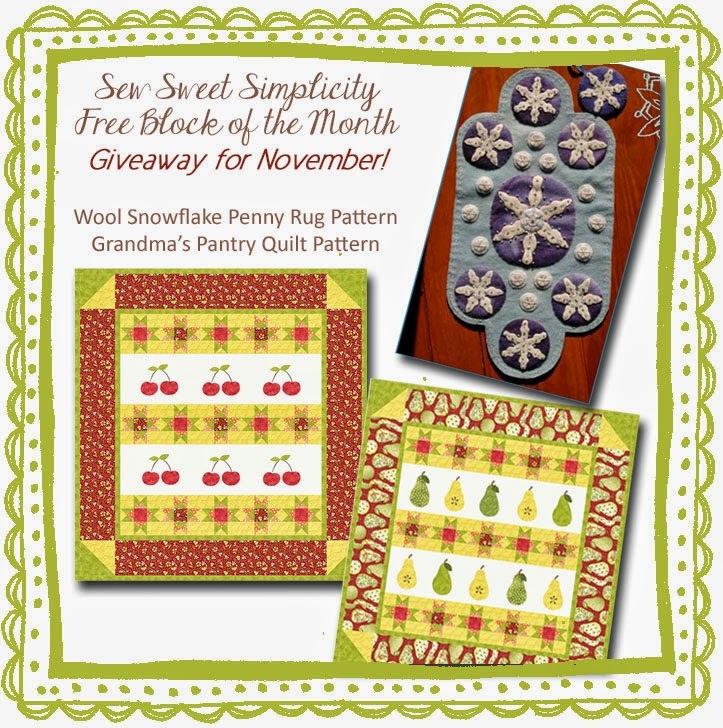 PATTERN GIVEAWAY!!! There has been a slight mix up...but...better late than never...RIGHT????? So I have my center square done...all the pieces cut out (or do I)? Working on my half square triangles....using this Fons and Porter ruler. I love how she does her flying geese....almost fail proof! But here is Jacquelyne's #2 Square. Don't you just love her fabrics? She has kits available. Here is this months giveaway...just leave a comment!! This giveaway is open until Wednesday Dec. 2nd. I love the colours in your block. Thanks for the giveaway. Thanks for all of your wonderful comments.....sorry I didn't get back with you but did so enjoy them. I have made a fun simple block out to be the most complicated ever!!! I will just chalk it up to a bad sew day. Actually, I will be totally honest....... I missed a few of the directions in my haste to get this block completed. So.... 1. make sure you trim down your 7" middle square to 6 1/2" (yes, that will make a big difference and will eliminate a great source of frustration). 2. trim all of your half squares to 2" as mentioned in the post before this one. I cut off some of the flying geese points....I think I stretched and pulled this poor block in every way possible...so I am now going to make another one. Truly, this block is totally beautiful, I love love love it. In fact, I think it is one of my favorites but.....I just made a mess of it. JUST A PUTTERING OVER HERE. I finally got the fourth row on this quilt using Island Batik fabrics. Fits nicely on a queen size bed. Well....I believe I am getting kinda lazy, I am wondering if I should just put the last border on and forget it or should I continue on making it big enough for my king size bed? Hummmm so that is the question of the day. I will say that this fabric is soooooooooooooo awesome. This picture does not do it justice. also..if you look in the middle of the stars, no middle is the same. It is amazing what one can do with half squares. On a side note: My aunt turns 100 tomorrow and she doesn't even look like it. She still lives in her own home and for the most part has her senses about her. I have been wanting to make this little doll for years. The other day I decided it was time. Now there is something about me that is off, I hate reading directions. I am a visual learner. This pattern is mostly directions and no pictures. Gotta have pictures...just gotta. Lucky I had my "Lapel Sticks"....truly....I glued the 1/4 inch seam allowance under and just slipped the arm in....it wasn't a breeze but it certainly was easier. For a few years now Gene Black has been doing "Angels of Love"
He makes and gather quilts for a youth shelter in his area for Christmas. If you want to know more about this, go to the above site, just click on Gene's name. Just make one quilt, you will be surprised how one quilt will make a difference in someone's life. I decided to tackle 50 this year and hope to have them done by the end of the month. Not really gonna say who they are for right now....maybe later. THE REST OF THE STORY.....WHAT HAPPENED TO OUR STEAM A SEAM??? If you have been with me since the beginning of my blog, you would have known that I used Steam a Seam like I used toilet paper, or better yet like I eat chocolate!! WHAT HAPPENED TO OUR STEAM A SEAM!!! Just click on the sentence above in caps and it will take you to the story of what happened. It was interesting to know but a lot of us have moved on. I have switched to HEAT N BOND, I use the Heat N Bond lite and I love love love it. 1. What is more important to me since I live in a small town, Walmart carries it. 2. Also it is at an affordable price for those of us counting our pennies. 3. It comes in a roll. Yes, you can get Steam a Seam in a roll but at a cost and I believe you have to order it in a roll if I am not mistaken. 4. I also like the idea that it has a stronger paper backing than Steam a Seam, just makes it easier and it doesn't fall off the backing like Steam a Seam does at times. HOW CAN ONE BE GOING THROUGH A DRY SPELL WHEN IT IS RAINING OUTSIDE??? I don't know about all of you but I so enjoyed Sew Cals "It's all about Kids Crafts Blogging Event," it was so fun to see the creativity of the actual blog post and the children and ideas involved. I love working with children and soon I will be teaching two very adorable girls to sew. My suggestion, just because I want to. Look at these two mischievous rascals.... We put a pillow in their little house for comfort and well...they just thought it would be more fun to tare it up.... I must admit, it was fun watching them (yes, I would have taken it away if I had seen the pillow whole but by the time I saw them it was a snow mess). One of the projects the Ladies at church wanted to do was make quilts for those expecting. If you know anything about Mormons, we tend to expect a lot...HA!!! Nothing to do with our time? TV broke? HA!!! Just kidding....well...it seems that the gals put the squares together, I put the sashing and then my soon to be daughter in law tried out her quilting skills. For her first time she did a fantastic job! I think she is a natural. She quilts but has never machine quilted before. I also want to say that polyester batting is just horrible to machine quilt. I so love my warm and white, those backing and top just snuggle up to the batting that you hardly get any wrinkles in the back. Just a small tip for those of you thinking of machine quilting. Last year this time I was in the process of moving. Vance and I were going back and forth bringing our household goods to our new home and decorating was out of the questions. So today I was able to find a few things, I am so excited, each year I add to my Thanksgiving collection. This turkey is on one wall in my sewing room. My husband was finally able to put rods up for me. This is on a wall in my sewing room, I did this one in Samoa from a pattern (gave the pattern away) or I would tell you what pattern it is. In the dinning room. This one is real special to me because a sweet friend Betsy (Fiesta) sent this to me as a surprise. I just love it. I just think I might make me a few towels for my kitchen for Thanksgiving so I will see ya later. In the mean time. Hope you enjoyed your Halloween and will enjoy the up coming Holiday season.